It feels so nice to be feeling nice enough for outfit posts again! I was diagnosed with the same infection that I had over the holidays, and the recovery process took a lot longer this time. But I caught it quicker since I recognized the symptoms, and I finally went to see a specialist. And she put me on a longer antibiotic regiment to hopefully make sure it doesn't come back a third time. But apparently your chance of recurrence jumps from about 20% to 60% once you've already contracted the infection two times. Yikes! My treatment just ended three days ago, and it was good timing because my trip to California is tomorrow! I booked this trip back in August of last year, and I had NO idea at the time how much it would end up meaning to me during my two bouts of illness. The idea of sunny California, reuniting with my friends, and getting to visit the happiest place on earth, really got me through a lot of tough nights and gave me a light to look forward to at the end of the tunnel. I'm still not feeling 100% yet, and in person I think my face has a very "on death's door" pallor to it, but I've made so much progress and I'm able to eat most of my favorite foods again (still holding off on beans and broccoli but I think I'll try them when I get back from my trip!) I've been going for walks with my dad every day, and my fitbit stats moved from "poor" to "fair" heart health -- which is the right direction at least! I'm feeling optimistic and happy... and honestly THRILLED that I'm not just wearing pajamas every day anymore, lol! Hey! Long time no see! 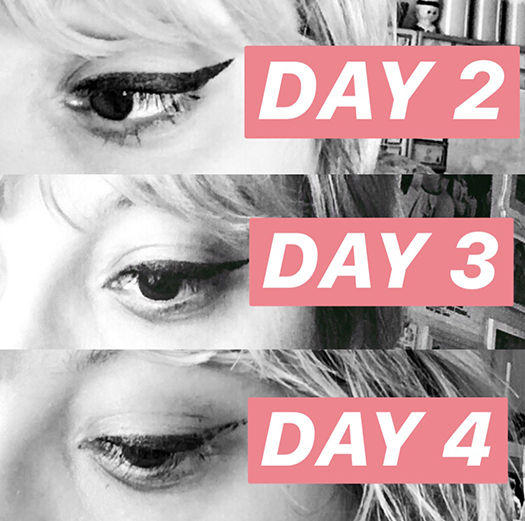 I'm planning on doing a little catch-up post to let you know what's been going on but first, I had to do this eyeliner post! 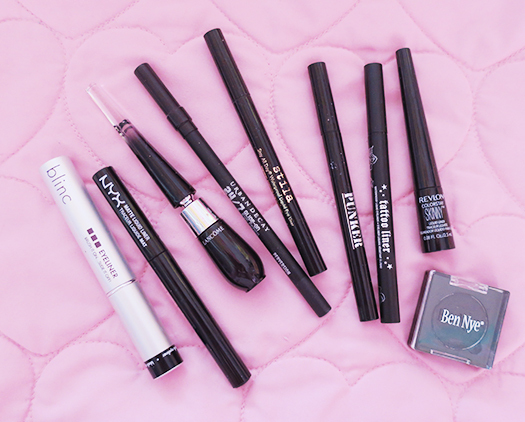 You NEED to know about this eyeliner. Trust me. A couple weeks ago I shared an experiment I was conducting on my IG stories. 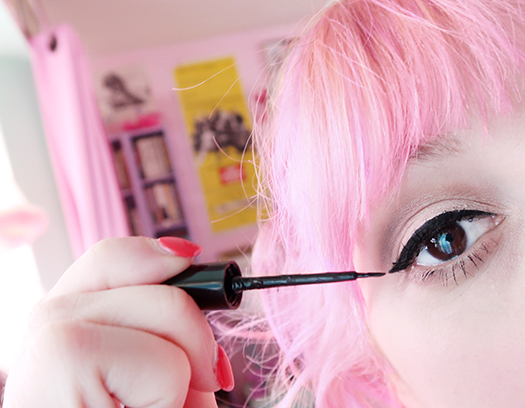 I was testing out a new eyeliner, and its staying power was INSANE. I slept with it on for four days in a row before it started to smudge/flake off. I'll admit it's not the best ocular hygiene ~but~ every single eyeliner I have ever tried has smudged or flaked before I even got in bed the day it was applied. The idea that one could last this long was insane. Out of these, the only ones I liked were the Stila Stay All Day liner and the NYX Matte Liquid Liner. But the Stila one doesn't produce a very dark black, it has a felt-tip marker applicator which isn't precise enough for me, and it pretty much disappears off of my lid during the day. The NYX one is darker and I like the brush applicator, but it's too wet and usually runs in my inner corner and transfers to my eyelid during the day. And in balmy weather it always slides around and makes me look like I smeared black all over my eyelid. And those are the good ones, lol. They've sufficed, but I was constantly searching for something better. First of all, the black is MATTE BLACK. Not a weak watery black, not a shiny vinyl looking black, MATTE BLACK. And it stays matte all day. The brush is a precise brush, not a felt marker. It's so easy to apply a perfect wing! But even if you don't like the brush, you can use your own brush to apply it since it's a bottle with a brush, not a marker with the ink sealed up inside. It does not budge. Even with super watery eyes, it stays put as soon as I apply it -- I can even tightline my upper lid with it and it doesn't bleed! I've worn it in hot weather, I've worn it when I was crying my eyes out, I've worn it to sleep for three consecutive nights, and I am in total disbelief at its staying power. It goes without saying (like I'd actually be sponsored by MAC? lol) but this is totally not sponsored. I'm just SO obsessed with this eyeliner and I want to sing its praises from the rooftops. I want everyone who's had the same issues as me to be able to stop searching. Personally I bought three bottles of the stuff after I tried it, just preparing in case it ever gets discontinued. Also, despite how well this stuff adheres itself to your eyelid, it *is* actually easy to remove with makeup remover. I use Cetaphil gentle makeup removing wipes, and it comes off pretty easily! So it's really the best of both worlds. You can fall asleep with it on when you're lazy and wake up ready to go, or you can responsibly wipe it away at night without much tugging on the lid. Win-win! Also, kind of off subject, but every time I've ever done a makeup-related post on this blog I've struggled so much to get a photo of my eye that doesn't look weird. I have such respect for makeup instagrammers.